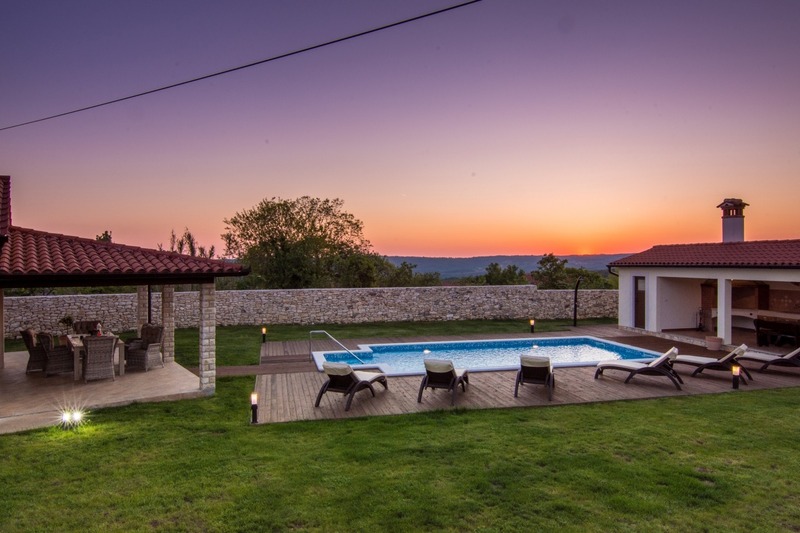 Villa Anica is a luxurious country villa with swimming pool located in a peaceful area of a small village Markoci, distant only 7.7 km from the picturesque town Labin and 11.5 km from Rabac and its beautiful sandy beaches. 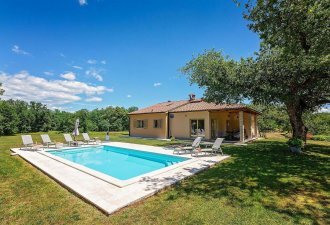 The whole house is built in stone in traditional Istrian architecture and it was completely renovated in 2016 in an extremely comfortable and luxuriously furnished holiday house with two bedrooms. Villa Anica is situated on a large, fully enclosed property of 1100 sqm with private swimming pool of 32 sqm, cozy outdoor kitchen, a large terrace with table and chairs by the swimming pool, swings and a slide for children, a separate toilet and parking for several vehicles. Villa Anica is a groundfloor house for 4-6 persons with a total living area of 150 sqm. It consists of a beautiful air-conditioned living room with leather furniture and a large window overlooking the terrace and the swimming pool, fully equipped kitchen, dining room, one double bedroom with two separate beds, SAT TV and private shower/toilet, one double bedroom with SAT TV, private shower/toilet and terrace, one separate toilet in the corridor.